iPhone 5: A GSM/CDMA World Phone? Apple is reportedly getting ready to beat back Google's Android army with an iPhone that's one-third smaller than the current model, has no home button and a contract-free price of $200. In other words, the iPhone Nano rumors are back. But mini-iPhone rumors have new company this time. Turns out Apple just might be working on a dual-mode iPhone that runs on GSM and CDMA networks, and a universal SIM card may also be baked in to the iPhone. The latest rumors come from a Bloomberg report published Friday citing anonymous sources that have "been briefed on the [Apple's] plans." The iPhone Nano, Could It Be True...This Time? Rumors about a so-called iPhone Nano are almost as old as the iPhone itself, first appearing in the summer of 2007. Ultimately, those past iPhone Nano rumors went nowhere, but that was before the advent of Google's Android and a slew of devices from major phone manufacturers including HTC, Motorola, Samsung and Sony. Google's strategy of putting Android on every device imaginable vs. Apple's "one OS, one handset" game plan is eerily reminiscent of Apple's desktop war with Microsoft. A war that Apple ultimately lost. There are signs that the same thing may be happening again. Android is 3 percentage points ahead of the iPhone in the U.S. smartphone race as of December with 28.7 percent of the market compared to the iPhone's 25 percent, according to comScore. In April 2010, Android had just 9 percent of the U.S. smartphone market compared to the iPhone's 25.4 percent. To fight off Android's massive growth, a $200 iPhone Nano might do the trick. It's also interesting that the so-called iPhone Nano could be without a home button--a hardware strategy that Google is also pursuing with Android 3.0-powered tablets. The rumored mini-iPhone is said to have similar components to the iPhone 4 possibly including the A4 processor. It's not clear if the rumored iPhone Nano would have the iPhone 4's FaceTime camera. Rumors and speculation about an iPhone that would work on both GSM and CDMA networks have been circulating since Apple's recent introduction of a CDMA-only iPhone for Verizon's network. 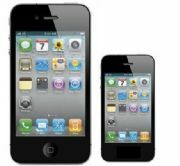 The iPhone as world phone rumors increased after the DIY site iFixit discovered the Verizon iPhone had a dual-mode GSM/CDMA chip but was limited to receiving only CDMA signals. GSM is a near-universal cellular network standard used by AT&T and T-Mobile, while Verizon and Sprint are CDMA networks. The rumor that Apple may be working on a universal SIM first popped up in October, after news the company was working with SIM-maker Gemalto on the project. Typically, a GSM phone requires a carrier-specific SIM card (a small piece of plastic not much bigger than a penny) that you have to switch out each time you change countries or carriers. Instead of doing that, an iPhone with a universal SIM would work on any network and include software allowing you to activate the device yourself without having to deal with the carrier directly. The original iPhone had a similar self-activation process that you did at home via iTunes. Of course, for Apple's universal SIM scheme to work it would have to convince carriers to play along. Something Apple may find challenging given cellular providers' reluctance to give up control over devices accessing their networks. Bloomberg says it doesn't know if the iPhone Nano would also be a dual-mode phone or have the rumored universal SIM card.